Here comes the first Korean zombie movie! Why should Americans have all the fun when it comes to zombie outbreaks? In this tongue-in-cheek 2009 thriller, Seoul is overrun with the walking deadand the government says it’s time to wipe them out! A six-part comedy/horror anthology from four cutting-edge indie directors, The Neighbor Zombie follows an unbelievable zombie outbreak as it spreads throughout Korea, examining the numerous people it affects in bizarre, wild ways. With an amazing $18,000 budget, it embodies the pinnacle of what a talented group of filmmakers can accomplish if they put their delicious, juicy brains together! 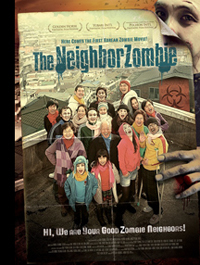 The Neighbor Zombie makes its US premiere at 7 PM, Tuesday, April 30th at the Tribeca Cinemas (at 54 Varick Street on the corner of Canal Street, one block from the A, C, E and 1 train Canal Street stops). Admission is free, and all seating is first-come, first served. Doors open at 6:30 PM. Run dead, don't walk dead, to see The Neighbor Zombie!